Computer Science Education Week (December 5-11, 2016) serves as an annual opportunity for youth and adults to explore Computer Science (CS) and Computational Thinking (CT). This past January, President Obama called for every student to be given the opportunity to learn computer science, declaring computer science to be "a basic skill just like reading and writing," critical to the modern economy. CS for All, announced by the Office of Science and Technology Policy (OSTP) and led by the National Science Foundation (NSF) and the U.S. Department of Education (ED) in partnership with other federal agencies and private partners, is ensuring that CS education is available to all students across the U.S. View the December 5 White House Fact Sheet for more information on how agencies and private partners are working together, including the new NSF program solicitation, Computer Science for All: Researcher Practitioner Partnerships (CS for All: RPP). The ITEST program has been funding projects and research aimed at exposing youth from populations underrepresented in STEM to computer science, engineering and programming, to the computational thinking since 2013. Below are selected ITEST computer science-focused publications, resouces, and projects that are addressing the goals of CS for All. (Blog) EDC’s Joyce Malyn-Smith discusses how technology can help all students extend their own thinking and solve complex problems. (Publications) This synthesis is based on a review of publications from ITEST projects, specifically relating to STEM learning games and game design experiences for students. (Project Profile) The goals of the project are to motivate the participation of middle school students in urban and rural settings to pursue STEM and computing (STEM+C) careers. The project will develop an integrated curriculum that supports the learning of computing and engineering fundamentals through the underlying mathematics concepts. (Project Profile) This project will engage middle-school urban girls in learning sophisticated computer programming and electronics within supportive communities where the learning is embedded in meaningful projects. (Project Profile) The project will develop implement, and test an expansion unit using electronic textiles for the Exploring Computer Science (ECS) curriculum that is currently implemented in high schools across the nation by providing an alternative to the existing robotics unit that can appeal and recruit larger group of girls and address the longstanding lack of women and minorities in computing. (Project Profile) Involving more students from urban and rural areas in STEM fields and careers has been at the forefront of national STEM education reform efforts for decades. Research shows that engaging these students in STEM activities relevant to their everyday lives is critical to increasing their motivation, interest, learning, and participation in STEM. 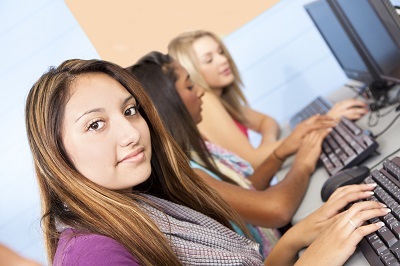 (Project Profile) This project, targeting high school Hispanic girls, will research how a coherent set of experiences supports student competency, motivation and persistence for productive participation in the Information and Communication Technology (ICT). workforce of the future. Participants will join other young women to take part in the Women's Hackathon @ CSUSM (California State University San Marcos) and participate in an after-school program that focuses on computer programming, career education, team building, and the non-programming components of the software development process. (Project Profile) This ITEST Strategies project will create a partnership of the University of Massachusetts Lowell (UML), the Tri-City Technology Education Collaborative Inc. (TRITEC), and the urban school districts of Medford and Everett, MA to bring project-based, socially-relevant computing experiences to district middle school students. (Project Profile) The SPARCS project will support 72 teachers of grades 7-9 to integrate computer science into their science and math instruction. Because the world is adopting computational tools quickly, students need to learn about how computational technology can be leveraged to make informed decisions. (Project Profile) The project will research the effects of single-gender computer science (CS) camps and gender aligned role models within that context. (Instruments) The Computing Attitudes Survey (CAS) is an extension of the Colorado Learning Attitudes about Science Survey and measures novice-to-expert attitude shifts about the nature of knowledge and problem solving in computer science. It has five subscales related to different facets of attitudes measured on the survey (transfer, personal interest, problem solving strategies, real world connections, and fixed mindset). Validity and reliability of the CAS has been evaluated with first-year undergraduate students in a variety of classes for both majors and non-majors in computing fields at multiple institutions.